American life can be excessive, to say the least. That's what Jen Hatmaker had to admit after taking in hurricane victims who commented on the extravagance of her family's upper middle class home. She once considered herself unmotivated by the lure of prosperity, but upon being called ';rich' by an undeniably poor child, evidence to the contrary mounted, and a social experiment turned spiritual wa… s born.7 is the true story of how Jen (along with her husband and her children to varying degrees) took seven months, identified seven areas of excess, and made seven simple choices to fight back against the modern-day diseases of greed, materialism, and overindulgence.Food. Clothes. Spending. Media. Possessions. Waste. Stress. They would spend thirty days on each topic, boiling it down to the number seven. 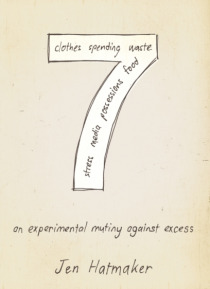 Only eat seven foods, wear seven articles of clothing, and spend money in seven places. Eliminate use of seven media types, give away seven things each day for one month, adopt seven green habits, and observe ';seven sacred pauses.' So, what's the payoff from living a deeply reduced life? It's the discovery of a greatly increased Goda call toward Christ-like simplicity and generosity that transcends social experiment to become a radically better existence.